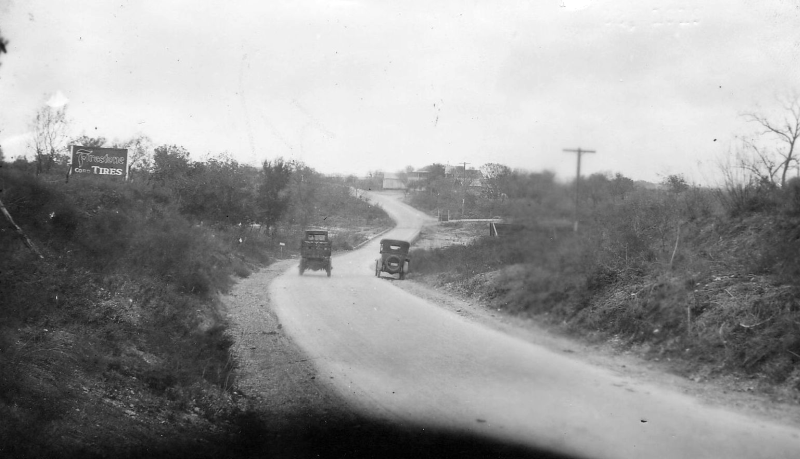 Below are historical photos of Austin Highway including the old highway to New Braunfels. 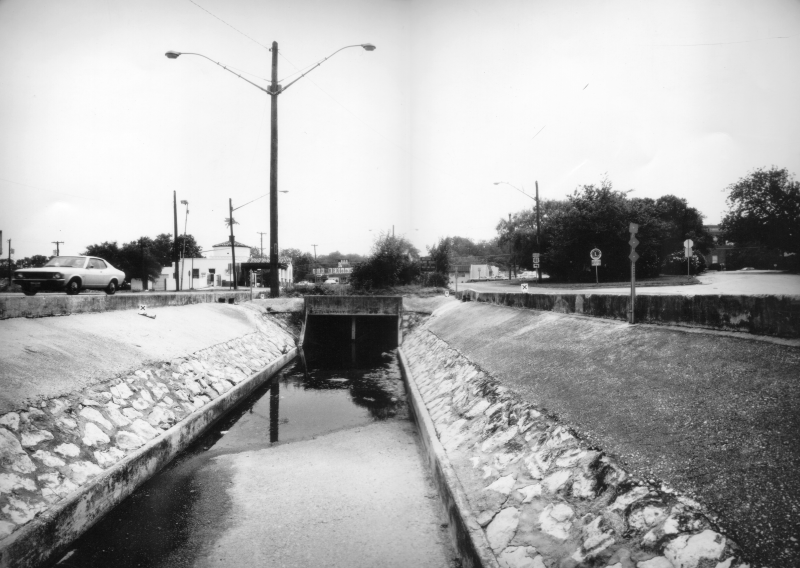 These photos were compiled from the TxDOT photo library and the San Antonio TxDOT district office. Locations are given using the present-day roadway names. The photos are arranged generally from south to north. Click on each photo for an enlarged view. This road has an extensive history and has continuously been one of the most important and busiest roads in the state. Parts of this route were on the El Camino Real that ran from Mexico via San Antonio to Nacogdoches, Texas and on to Natchitoches, Louisiana. Later, most of this road was part of the Meridian Highway, a network of north-south roads stretching from Mexico and the Gulf of Mexico to Canada delineated around 1910. When the state highway system was first developed in 1917, this road was SH 2. 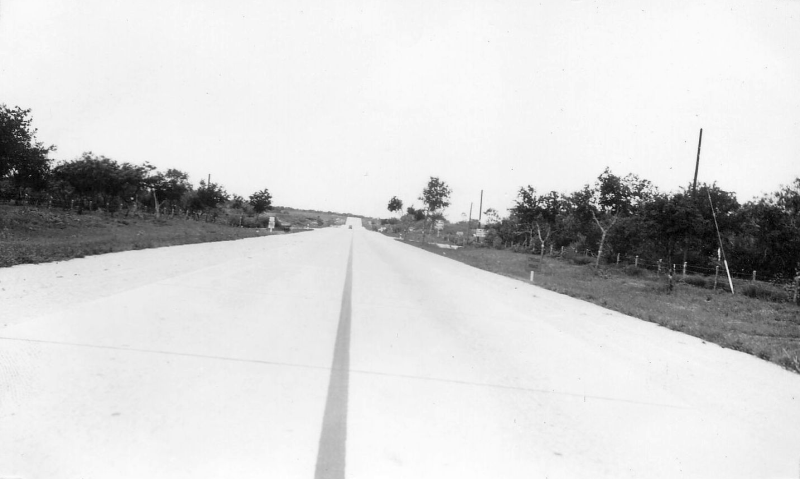 With the implementation of the US Highway System in 1927, it was numbered US 81. Eventually, this corridor was replaced with I-35. 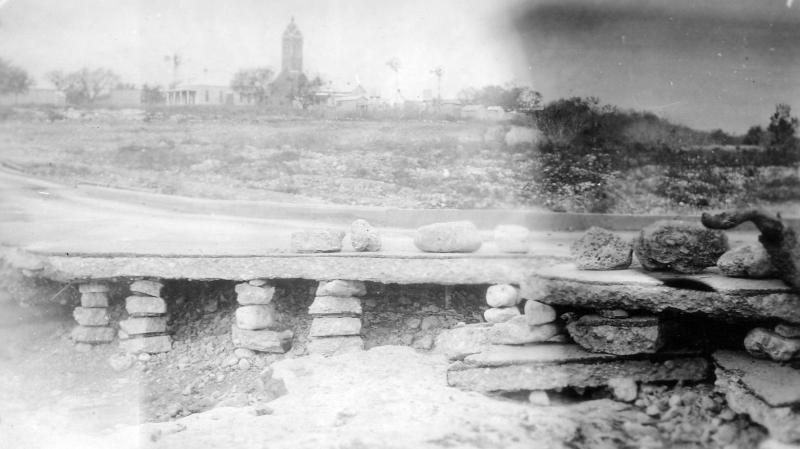 In San Antonio, the early routes to New Braunfels took several paths through the city. Some maps show it going up Austin St. (or alternatively Broadway, then known as River Rd.) to Grayson St, then east from there to New Braunfels Ave. where it turned north. 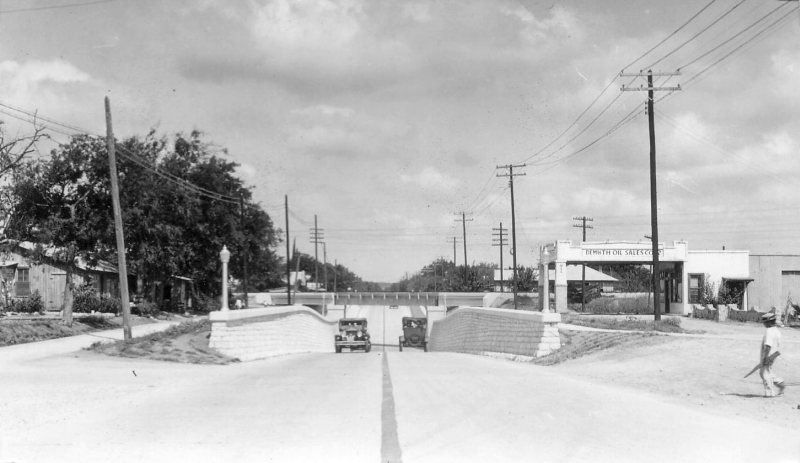 In the mid '20s, it seems the designated state route was east on Houston St. then north on New Braunfels Ave.
From there, the route went north through Fort Sam Houston, turned right onto today's Elanor St., and then veered onto what's now called Old Austin Rd. (and now you know why it's named that!) It then went back through Fort Sam Houston near the old BAMC and onto today's Harry Wurzbach Road. At Rittiman, it continued onto today's Corinne Dr. to Austin Highway. 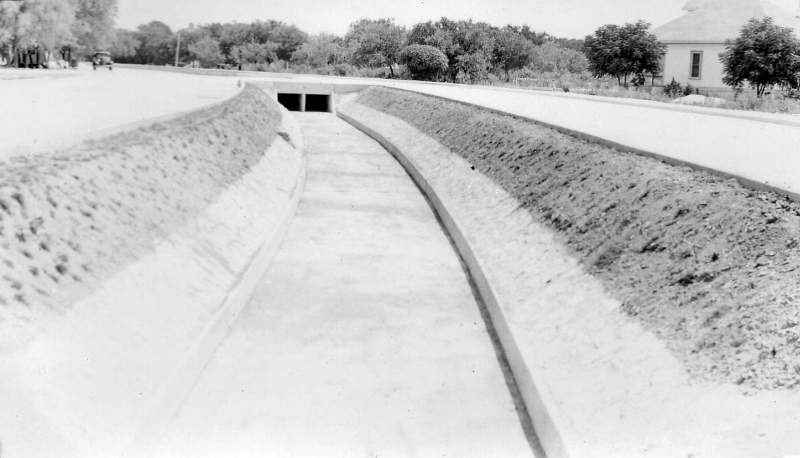 From Salado Creek, the route followed Austin Highway northeast through the former community of Fratt, which was located at today's interchange of Loop 410 and I-35. It then continued northeast along today's Sherri Ann Rd. and onto Randolph Blvd. 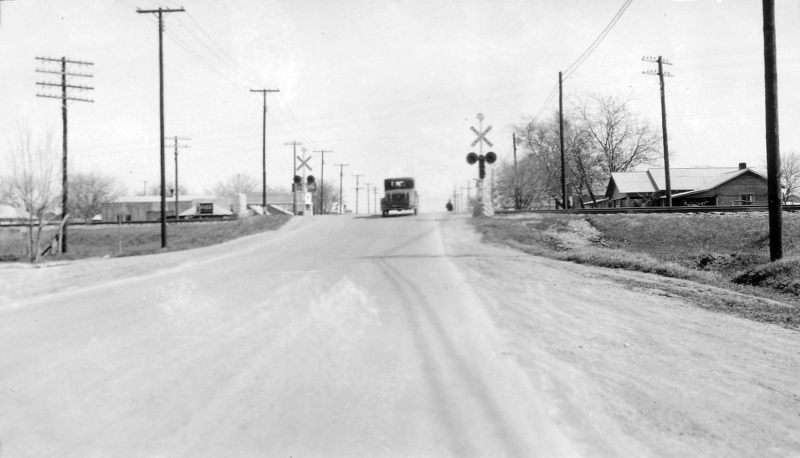 In the mid '30s, the section of Randolph Blvd. paralleling Serri Ann Rd. from the railroad tracks at Fratt to Weidner Rd. was built to provide a straighter and wider route there as per Arneson's recommendations. From Weidner, the route continued northeast along Randolph Blvd. and onto today's I-35 at Judson. Continuing northeast, it left today's I-35 route briefly near today's Loop 1604, following what's now Old Austin Rd., returning back to today's I-35 at Olympia Parkway. This section of Old Austin Rd. was also bypassed in the mid '30s. From there, the route continued along I-35 through Selma all the way to today's FM 2252, where it then took the route of today's FM 482 nearly to New Braunfels. 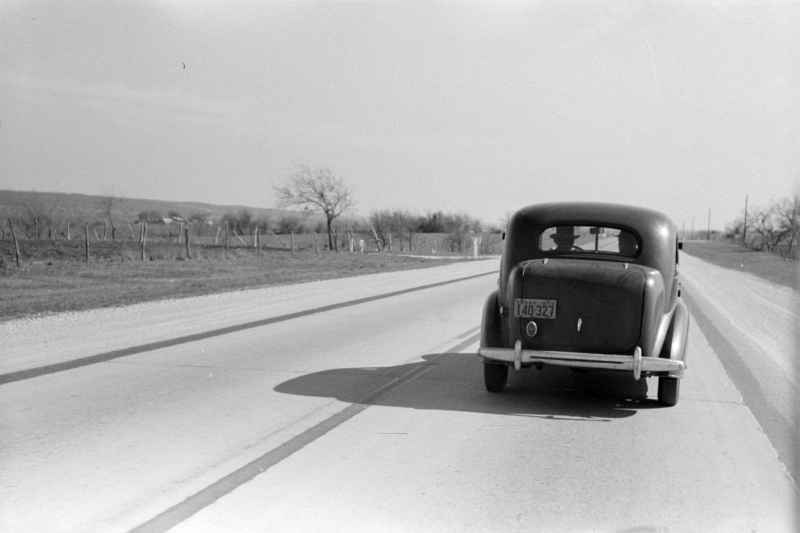 At Rueckle Road, it rejoined today's I-35 briefly before entering New Braunfels via San Antonio St. By the mid '30s, it appears most of the FM 482 route had been bypassed along today's I-35 with the exception of the section between Solms and Rueckle; the short stretch of what's now Old Hwy 81 between FM 482 at Solms and I-35 at Doeppenschmidt Rd. was the northern end of the new route that connected it to the older route north. 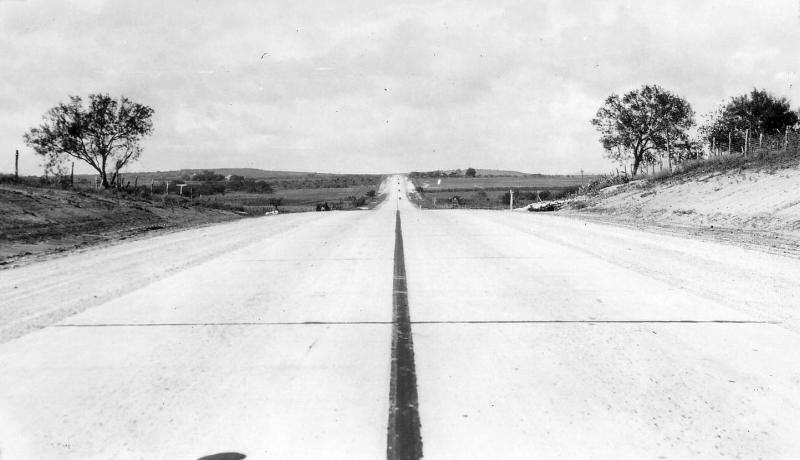 This was the route for US 81 until the completion of I-35 in the early '60s became the primary route to the northeast. 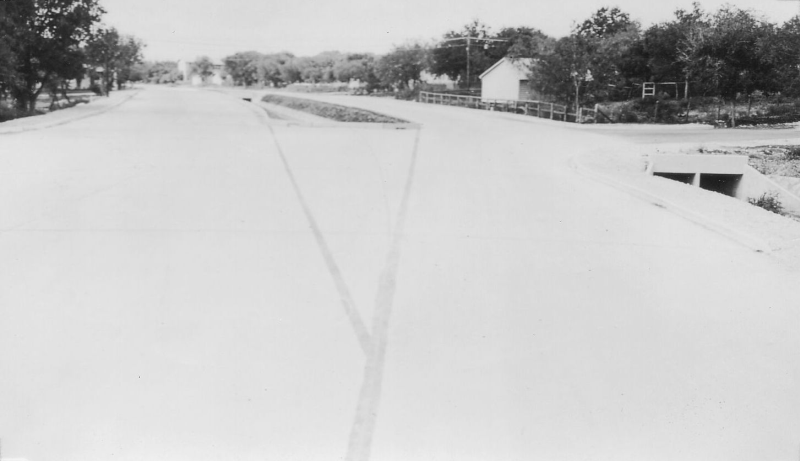 At Main Plaza in New Braunfels, the route turned right onto Seguin Ave., curved north onto Faust St., then crossed the historic Faust St. bridge before hanging a left onto Rusk and a right onto Church Hill Dr. It then continued onto the Post Road north along today's I-35 to FM 1102 into Hunter, then on to San Marcos via Hunter Rd. 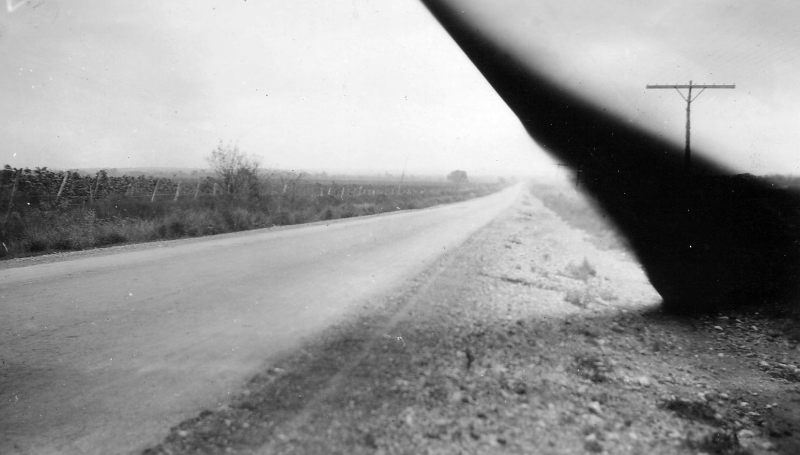 (FM 2439.) 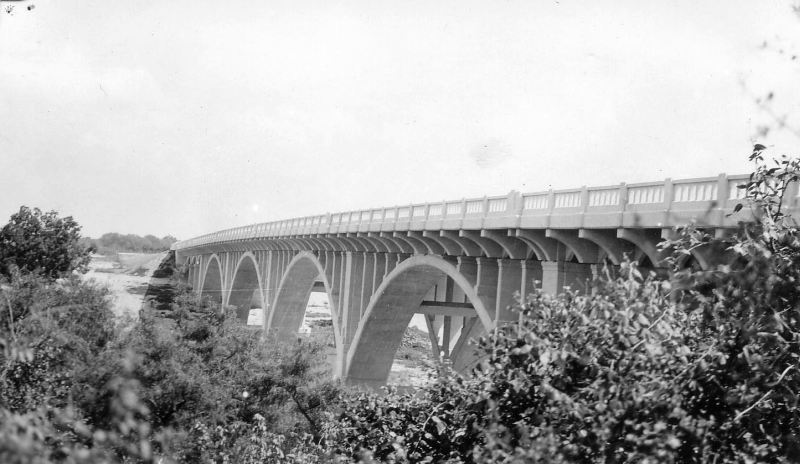 The entire route through New Braunfels would be bypassed by the mid '30s with the construction of today's Business Route 35 and its then-spectacular (and still impressive today) bridge over the Guadalupe. This drainage ditch has since been covered over. This seems to be just east of Broadway looking northeast. This was shortly before this road opened to provide a new route for US 81 and SH 2 to bypass the route through Fort Sam Houston. This could be at Montclair looking northeast. It appears the road ends a couple of blocks ahead-- that might be at New Braunfels Ave. which was the dividing line for the two projects that built Austin Hwy between Broadway and Corinne Dr. 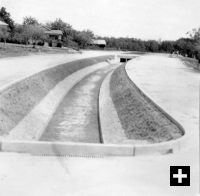 This could be at New Braunfels Ave. looking west after the section from there to Corrine was completed. The original caption described this as near the southern end. Based on that, this could be along Corinne Dr. or Harry Wurzbach. 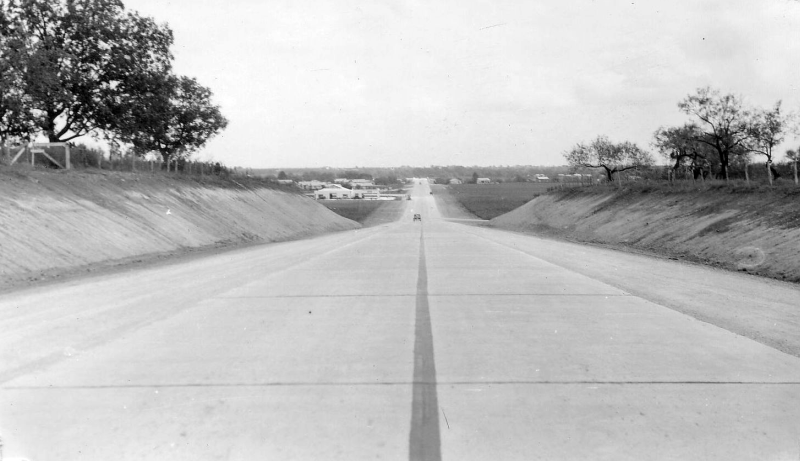 This is where the original SH 2 (and later US 81) curved onto today's Corinne Dr. 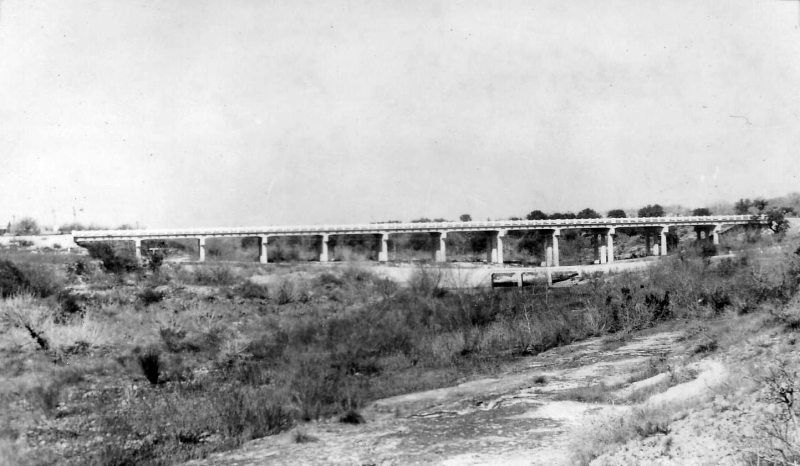 The concrete low-water bridge near the middle of the photo is still in existance today below the current Austin Highway bridge. This might be on today's Sherri Ann Rd. near Crestway looking southwest at the old town of Fratt. This is about where the northbound I-35 access road is today. The photo shows an improvised repair after flooding undermined the roadway. This is the location of the I-35 bridge today. The old low-water bridge can be seen in the foreground. 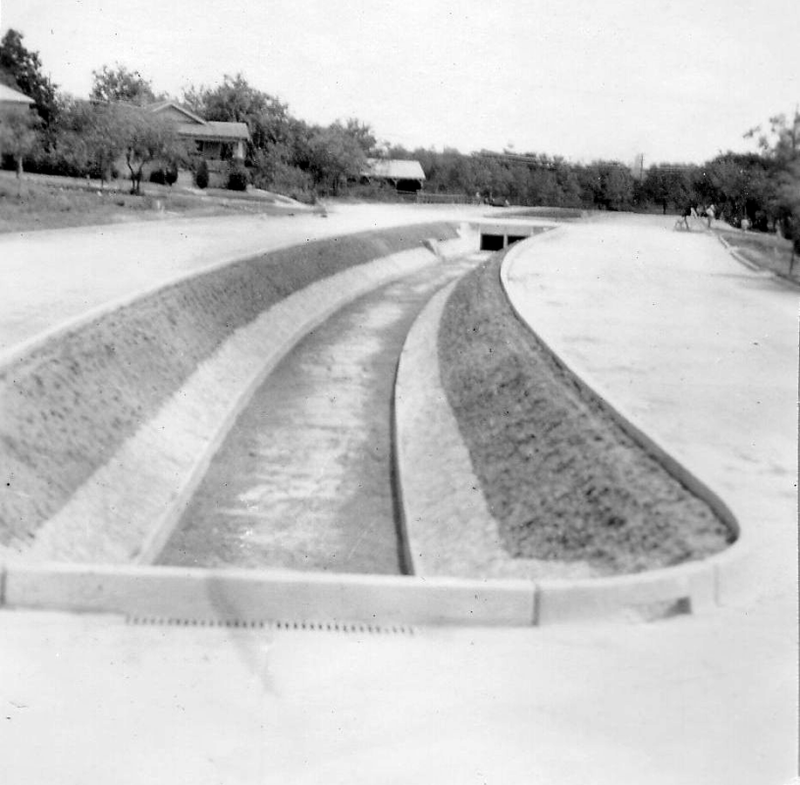 The original caption described this as "midway", presumably midway between San Antonio and Austin. 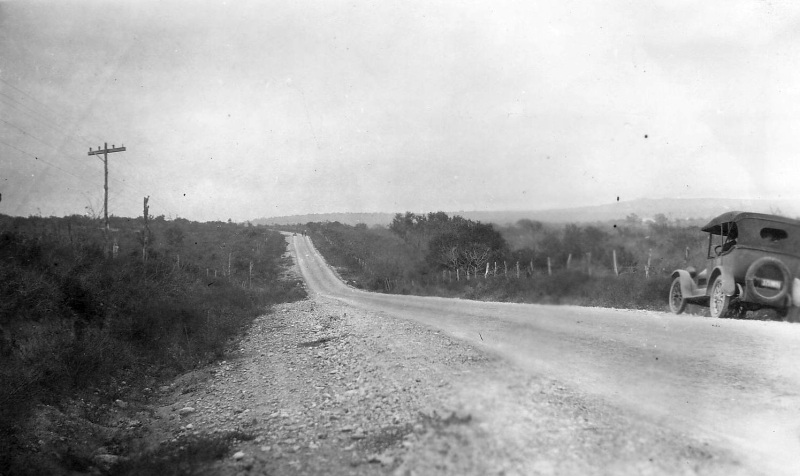 The caption for this photo was "scene on the highway north of San Antonio"; given the terrain, this would seem to be on the Austin Road between San Antonio and New Braunfels. This photo was before an underpass was built there. This photo shows the completed underpass. This photo was taken just after the bridge was completed. 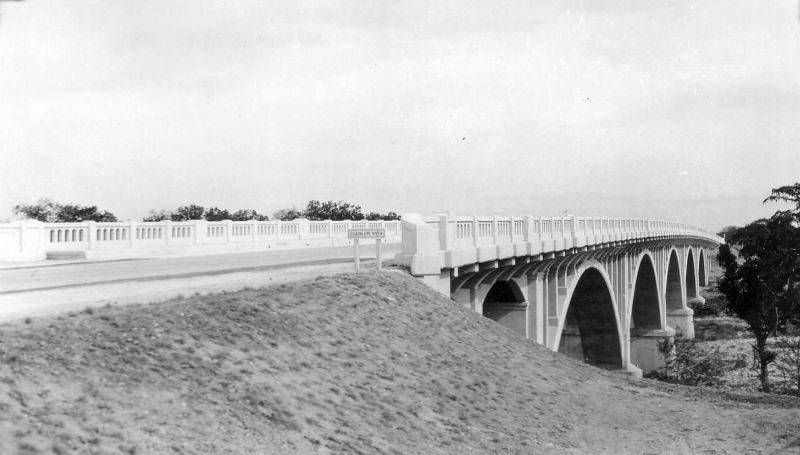 It replaced the Faust St. bridge as the route for US 81.